Despite good intentions, I’ve discovered that keeping up on a blog while traveling the width of the country is no easy task. Whenever possible, we’ve tracked down and run into antique shops and malls in pursuit of a “find.” In many cases, we’ve come out of the shop with a bag in hand. Often, however, the day is so busy that photographing the object and then writing about it and the shop where it was found just doesn’t happen. We are now on the verge of crossing the Mississippi River on the homeward bound trip, and I need to catch up! My solution is to do a catch-all with the photographs I have. By no means am I going to mention every shop in every town that we’ve visited. Before writing about the Now and Then Second Hand Store in Orange, CA, I left off with a blog about Abilene, KS. We visited a few other antique malls in Kansas and made some purchases, but I’m going to jump to the state of Colorado. Florence, CO: We had never heard of Florence, Colorado, but we picked up a little booklet that listed Colorado antique shops, and we noticed that it billed itself as the antique center of the state. When we looked at the map, we realized that it would be within a few miles of our planned route. Naturally, we made that slight detour, and we’re glad we did. Not only were there multiple shops to check out, but we happened to visit on a Friday, the first day of an antique street fair. Below are photos of a few of the things we found. 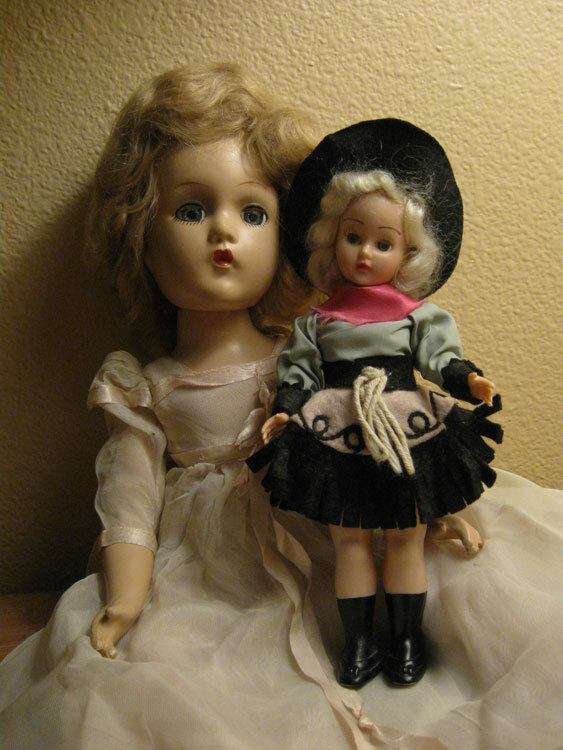 The larger doll pictured is a 1940’s composition Madame Alexander doll in what appears to be her original clothes. She cost $5 at the street fair, a real bargain. The smaller doll is an inexpensive hard plastic doll from the 1950’s. Normally, I wouldn’t buy a doll like her, but she’s dressed in a really nicely detailed felt cowgirl outfit, so I look upon her as an appropriate souvenir of our trip. Discounted 40%, she ended up costing about $9. Jim has been doing very well finding political items on this trip. Florence came through for him. He bought a very nice Benjamin Harrison pin in porcelain with a metal border, dated 1888, for $75. Leadville, CO: This old mining town is at the highest elevation of any town in the U.S., and we were flying high with some of our purchases. The very first shop we went into was the winner. It was an old hardware store that retained all of its original fixtures, so the atmosphere alone was worth soaking up. We walked out with two pieces that we liked a lot and felt were reasonably priced. 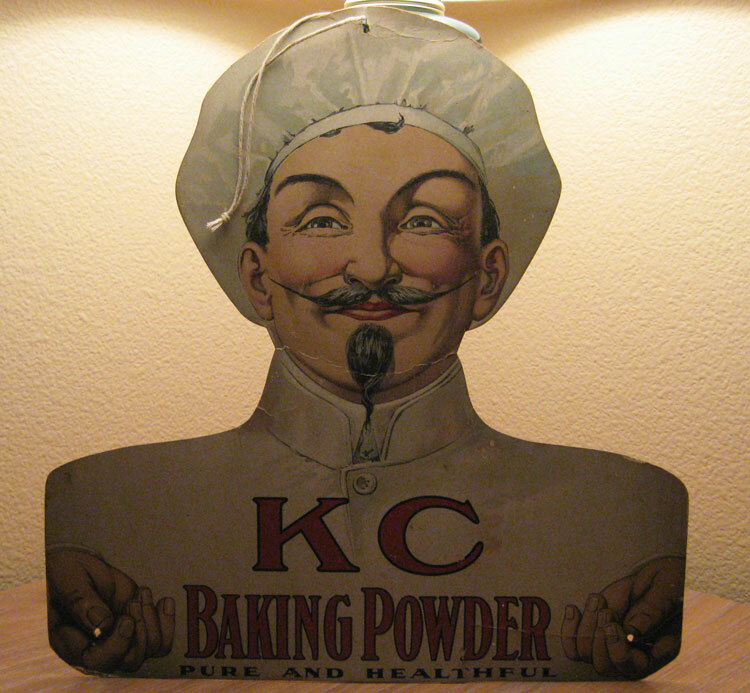 This cardboard sign advertising KC Baking Powder has some condition problems and likely had something else hanging from it, but we love the image of the baker and we will find a place for it in our kitchen. Best of all, it only cost $25. As those who know us know, we love to decorate for Christmas, and we love our Christmas tree with genuine Victorian/turn-of-the-century ornaments. I was hoping to find something to add to our collection, and Leadville came through. 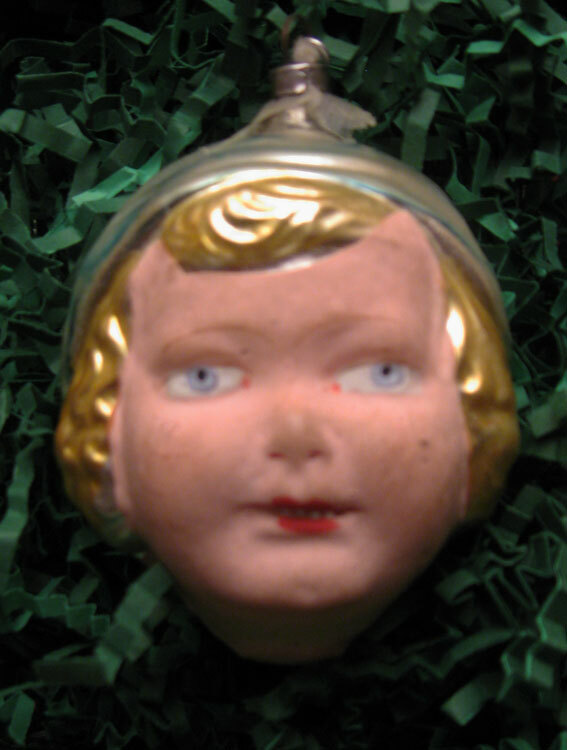 Pictured is a beautiful blown glass, hand-painted little girl’s head ornament. According to the shop owners, it came out of a local estate. Virginia City, NV: Once again, an old Western mining town came through for us. Tourism is what’s keeping Virginia City alive. Mixed in with the bars, restaurants, and souvenir shops are several antique shops. We checked them all. At the last one, Jim was very happy to find three nice political/advertising pinback buttons priced at $35 for all three. Best of all, he doesn’t already have any of them! The largest button is the most unique. 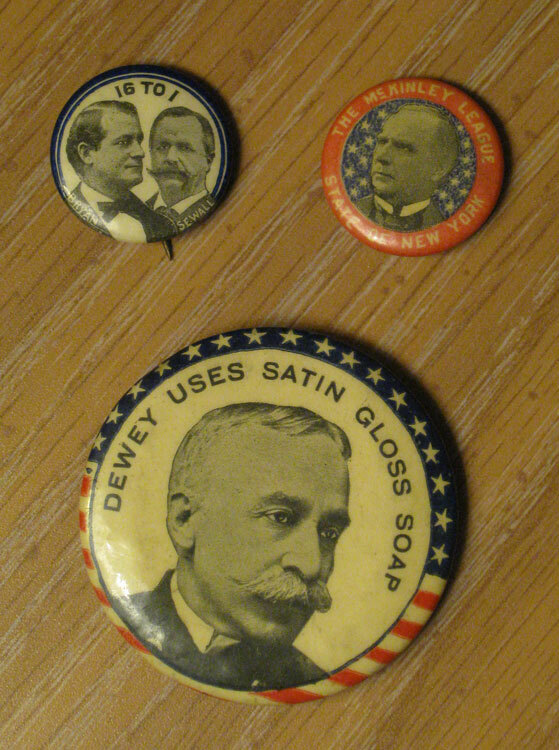 It pictures Spanish-American War hero Admiral Dewey advertising soap. There’s also a nice Bryan-Sewall jugate from 1896 and a McKinley Club of NY button. It isn’t often that you find one of these nice vintage buttons at the average antique mall, let alone three. We did do a little antiquing in California, principally in Orange, and we did purchase a few things. However, I have no photos, so we’re going to move on to Arizona. Prescott, AZ: While staying in Sedona, we took the recommendation of an antique dealer we know and went antiquing in Prescott. Prescott is a neat town. It was the original capital of the Arizona Territory, and there’s an interesting museum complex, the Sharlot Hall Museum, to tour. The downtown business district, which surrounds the courthouse square, is vibrant and alive. About two blocks of it are devoted to antique shops. We can’t share Jim’s favorite find yet because it’s still wrapped up in paper in the back of the car, but he was very happy to find an original political cartoon that appeared in the Los Angeles Times in October 1950. It shows President Truman wearing the “cloak of secrecy” in regard to a meeting with Douglas MacArthur on Wake Island. 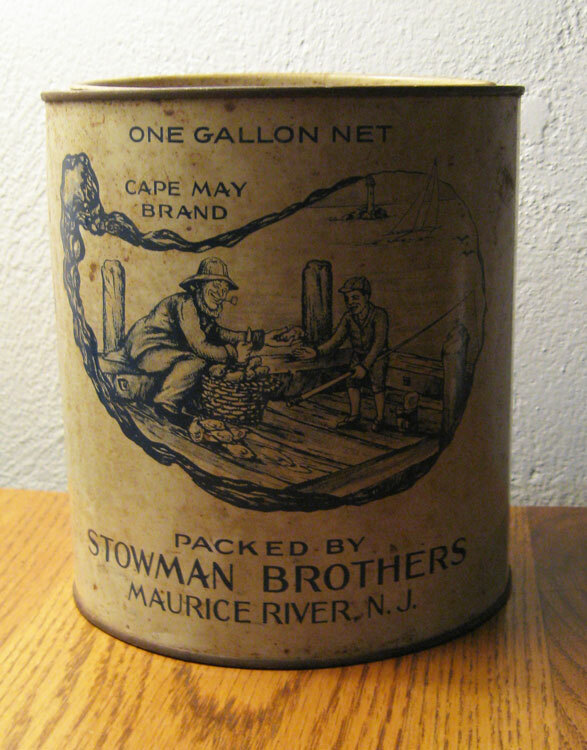 The other find we made there was an oyster tin right from our own neck of the woods. 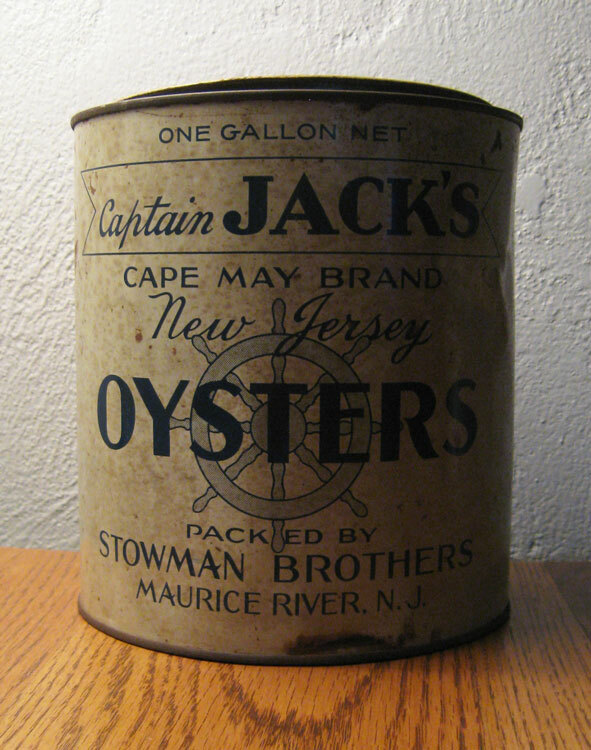 These photos show the front and back of the Captain Jack’s Cape May Oysters tin. The back mentions the Maurice River, too. Actually, we like the back better than the front of this tin. Not only is it in better condition, but the graphics are more interesting. And we found it in Arizona – how weird! We didn’t do any antiquing in New Mexico – none! We did stop briefly in Amarillo, TX, and we did buy a few small items there. Oklahoma was yielding a handful of small items, too, until we hit a shop in Shawnee, OK at the very end of the day. 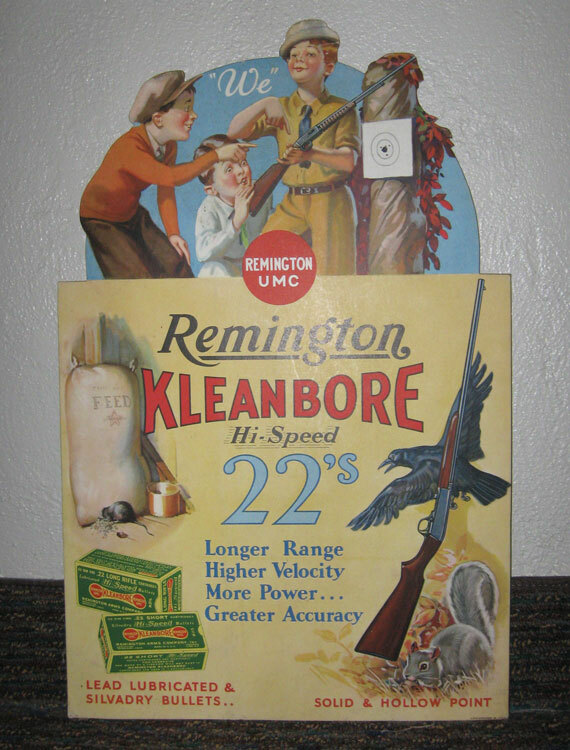 We were very pleased with the cardboard standee advertising sign for Remington rifles that we found for $40. The sign is in overall very good condition for its age. On the lower left corner, it looks like there might be a tiny “31” and that might indicate that it dates to 1931. It sure looks like it’s from that time. What better gift for little boys than a rifle? North Little Rock, AR: One frustration we’ve been having in particular on the return portion of our trip is encountering “antique” malls that have very few genuine antiques in them. They have faux antiques and decorator items, but that’s not what we’re looking for. When we saw an ad for the Twin City Antique Mall that asked the question, “Are you tired of antique malls that don’t have antiques in them?”, we knew that was the place for us – and it was. We came out with several items that we were very happy about. Jim has a couple of these Roosevelt Bear plates already, but this was a different one, and it was priced at only $25. 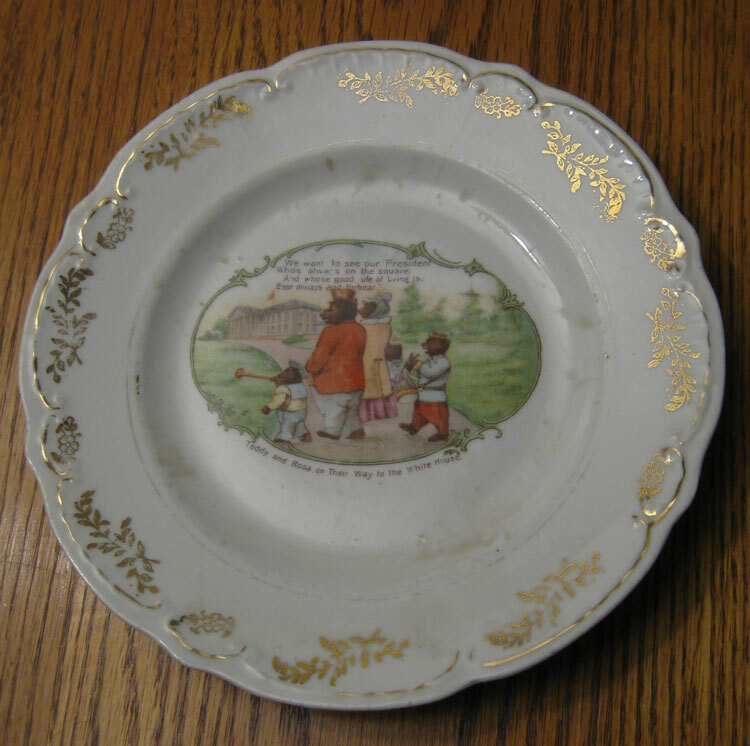 The inscription underneath says, “Teddy and Rosa on their way to the White House.” Above the bears it says, “We want to see our President Who’s always on the square and whose good rule of living is bear always and forbear.” It goes without saying that this plate dates to Teddy Roosevelt’s tenure in the White House. This interesting bisque ashtray and match holder caught our eye. 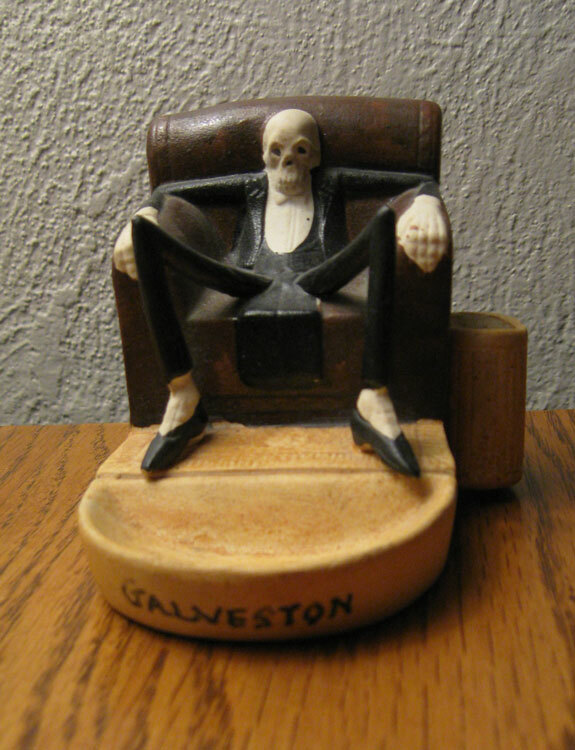 A cheap souvenir from Galveston, TX, most likely in the 1930’s, it shows a nattily dressed skeleton sitting in an armchair. It isn’t meant to be a Halloween decoration, but in our house it probably will be. We thought it was a good buy at $25. 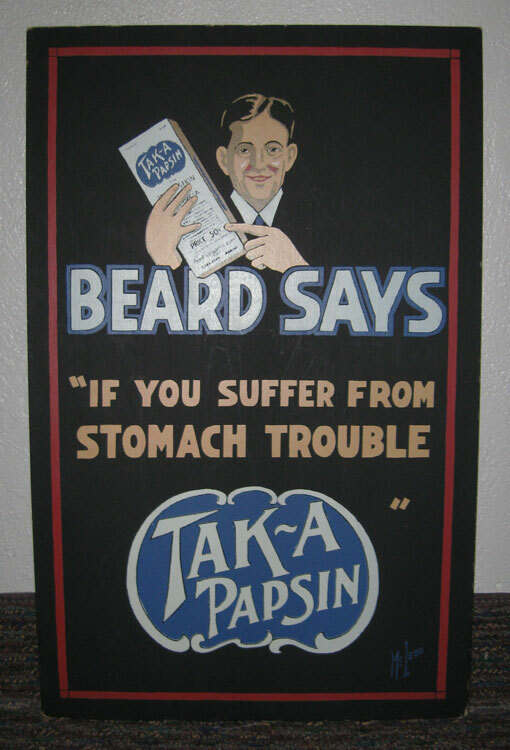 The last thing we bought at Twin City was a cardboard advertising sign for a product called Papsin. We liked the graphics and the fact that it was hand-painted by a commercial artist from Fort Smith, AR. He even signed it on the front. Whew! That was a lot of catching up to do. We still have several states left to cover. One more blog might do it. Of course, it might not get done until we actually get home. This entry was posted in 1800's, 1900's, 1910's, 1920's, 1930's, 1940's, 1950's, Advertising, Americana, Carol, Dolls, Ephemera, Historical, Holiday, Humor, Jim, Kitchen, Monsters, Political, Road Trip, Signs, Toys, Weird. Bookmark the permalink. These are incredible finds! Leave it to you to discover truly amazing stuff.